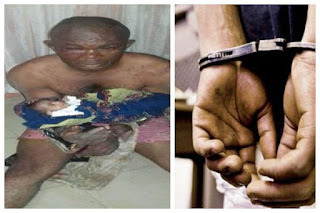 A 50-year-old man identified as Samson J. Enweriji, has been arrested after he was caught with a day-old baby, hidden inside a zipped handbag. The kidnap suspect was arrested for being in possession of a day old baby in Ohafia, Abia State. According to TheNation, the suspect was arrested by some soldiers, through a tip off, while attempting to escape with the child. When intelligence report had it that Enwereji was in the custody of an unknown baby around Okpu Umuobo, the army checkpoint in the area was activated and thereafter began a stop and search. The soldiers flagged down Enwereji in a black coloured Toyota SUV with two women who escaped, but a day-old baby hidden in women’s handbag and zipped with the sum of N84,000, was discovered in the vehicle. Also found on the suspect were a total sum of N13,000 and the placenta of a baby wrapped in a polythene bag, an indication that the baby was just delivered. Some youths in the area opined that the women and Enwereji might have killed the mother of the child. They urged the army authorities to ensure that they get to the root of the matter.